Enicar watches seem to be in the midst of a resurgence in popularity as of late and although not at the levels of horological achievement of Universal Geneve, Enicar has a solid following online due to their reliable movements and affordability. For nearly seventy four years Enicar produced watches that have been worn by mountaineers, a race car driver, Russian rocket scientist, U.S. Navy Divers and a ship. Yes, a ship has worn Enicar but I'll get to that later. When talking about old watch companies, we tend to forget in the beginning they were not the huge powerhouses of time that they are today and usually were little more than two people in room of a house. Like any startup today there are a number of key decisions to be made before entering into business, namely the location and the name of the company. Ariste Racine chose the sleepy center of Swiss watchmaking, La-Chaux-de-Fonds, as his HQ but was stumped with naming his business as his cousin Jules Racine had already trademarked the family name and was helping his cousin Leon Gallet import his watches, Gallet & Co, into the United States. 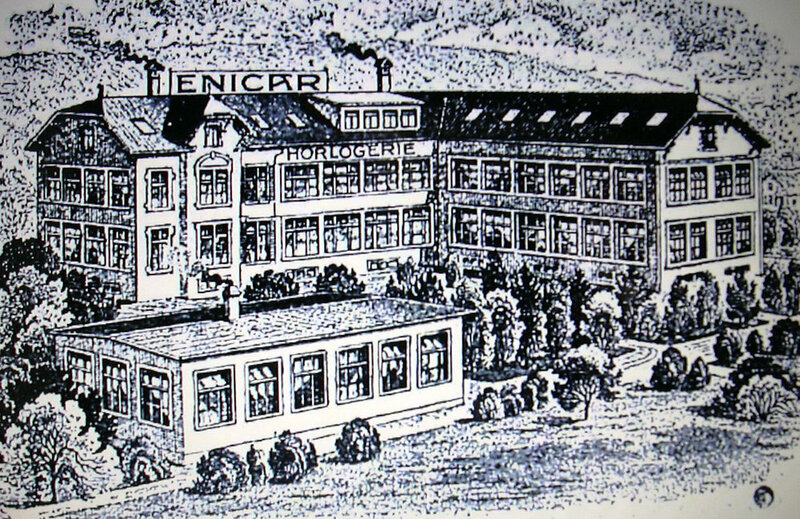 In a flash of inspiration Ariste's wife proposed reversing the family name and on January 6th 1914 ENICAR was founded. What separates Enicar from other brands lost to time is that they were incredibly popular in Asia, specifically China and Russia, due to their relative low cost and high quality compared to domestic made timepieces of the time. Universal Geneve were focused on the traditional elite market who could afford their complicated pieces whilst Wittnauer were focused on cracking the American Market. This left China and Russia completely open to a low to mid level brand like Enicar to prosper. To this day Enicar is still heavily marketed in China with many references on their website to the history and popularity of the brand in the country and according to Enicar Lei Feng, famed soldier of the People's Liberation Army of China, wore an Enicar watch which is displayed in his memorial hall in Fushun. It is worth noting that there is much speculation as to whether Lei Feng and his noble deeds were real as his idolized image was used as party propaganda. 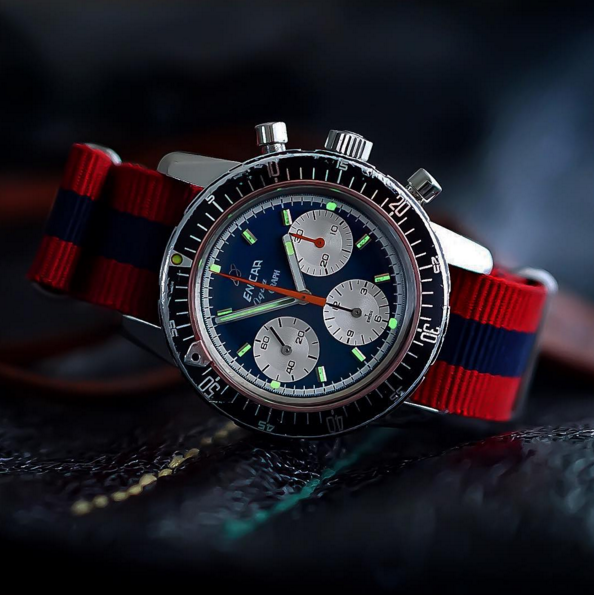 In 1951 the Sherpa Jet-graph was released, a strange combination of chronograph and GMT with a rotating twenty-four hour bezel with movable plastic marker to keep tracking of timing long events. In 1956 Enicar was enlisted as the official watch of the Swiss attempt to climb to the top of Mount Everest with expedition leader Ernst Reiss giving great praise to his Enicar watch which gave the then relatively small company a huge boost in public awareness. 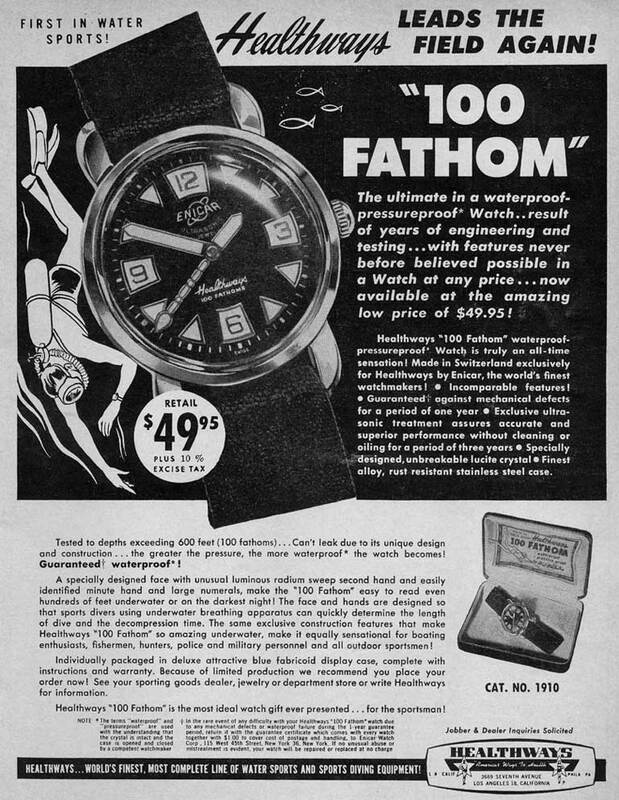 Soon Enicar were gaining popularity and even scored Sterling Moss as a spokesperson for their "Ultrasonic Sherpa". The Ultrasonic Sherpa in question was named because of the new technique of ultrasonic cleaning that an Enicar facility was now able to do. 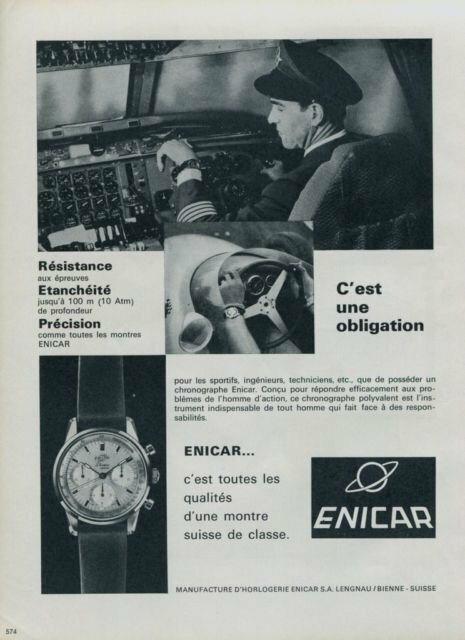 Throughout the years Enicar were always able to promote even the smallest achievements to high acclaim; for example their AR160 movement had "star jewels" and "Oil-stop". The oil-stop process was simply coating certain parts of the movement with acid to stop oil forming and star jewels was simply when a jewel was used as a stud for the minute wheel. In a brilliant display of P.R. Enicar proudly strapped an Ultrasonic Sherpa to the rudder of the Mayflower II, a recreation of the famous immigrant ship, and over the course of its fifty day voyage in 1957 managed to keep good time throughout. At the beginning of the twentieth century Russia was going through an unprecedented amount of social and cultural change so the life of any Russian born then would be eventful yet the life of Sergey Korolev somehow manages to stand above the rest. Whilst in Odessa in the early 1920s Korolev became interested in aviation and over the years developed his passion and knowledge to become an expert in rocket design, soon he was picked by Stalin's Arms Minister to head a research project on rocket weapons. Now a General-Engineer (One star) in the Russian Army, his rocket like success would unfortunately come crashing back down to earth only a few years later. Forever paranoid Stalin became convinced that his Arms Minister had "bonapartist" tendencies and sent him, along with the entire rocket research team including Korolev to the Gulags. It is during his imprisonment here that would lead Korolev to develop a heart condition that would cause his early death in 1966. After World War II Korolev would travel into Germany to interview captured scientists about their work under the Nazi regime and these scientists were recruited to work for the U.S.S.R. Through many years of research as Chief Designer Korolev managed to send up the first space shuttle with a human pilot (Yuri Gagarin) escaped Earth's atmosphere and enter orbit on April 12th 1961. It is most likely during his time working on the Russian space program that Korolev purchased his Enicar watch, a simple time only watch with a two-tone expandable bracelet. Eventually consigned to a 1993 Sotheby's Auction by Korolev's daughter, it was bought by a member of watchuseek who posted about his experience here. Without the connection to Korolev I doubt this piece would be considered that desirable but given his importance in the Space Race I think it's definitely a piece worthy of being remembered. Around the time that Korolev was working on the space shuttle with his faithful Enicar, the United States Navy were performing a series of tests on a variety of dive watches including two different Enicar watches, the Sherpa Diver 600 and the Seapearl 600. The Seapearl was immediately disqualified as it didn't have a diving bezel to measure elapsed dive time. It is interesting to note that whilst the divers were impressed with the Rolex watch they said that "the additional cost (and prestige value) does not appear warranted in view of satisfactory service of cheaper watches". The results of over 100 working dives ranging from 90ft to 200ft showed the Enicar performing well and that the lume was very clear even at great depths. These tests and comments from the Diving Unit speak to the quality of Enicar watches especially when they were pitted against brands of higher prestige like Rolex and Blancpain. 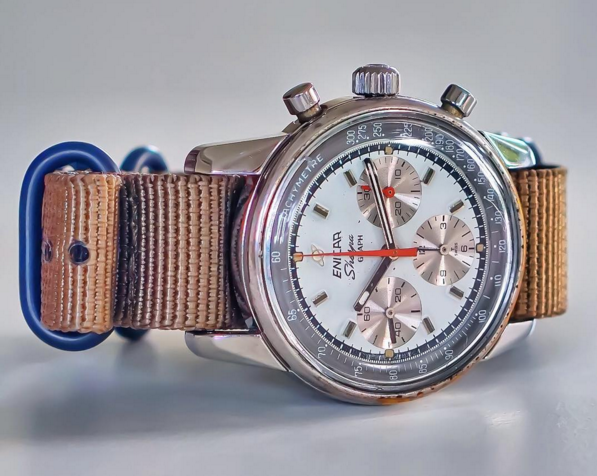 Perhaps one of the most endearing Enicar models was the Sherpa-Graph, a beautiful chronograph that uses none other than the legendary Valjoux 72 movement that was also used in the Rolex Daytona. There were numerous iterations with a variety of subdial colors but the most popular today is the reverse panda dial that is so similar in look to the Daytona. 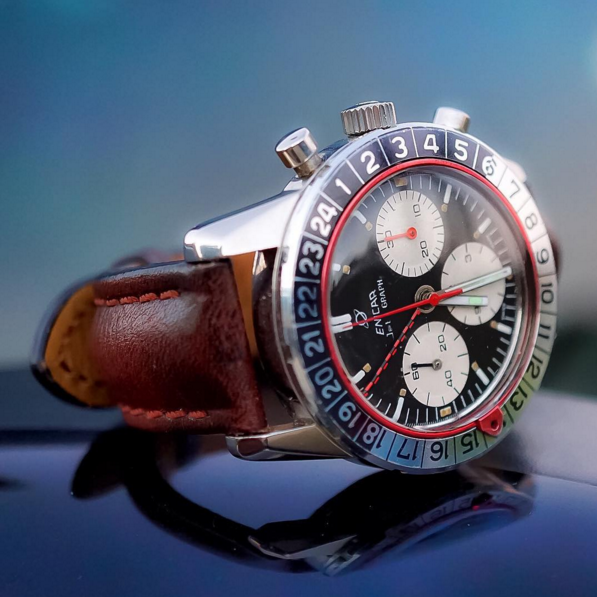 It's not an identical copy though as rather than screw down pushers however the Sherpa-graph uses simple pump pushers and the large rectangular hour markers don't have the same elegance that the simple dots of the Daytona do. Unfortunately the end of Enicar came much like that of Universal Geneve. Enicar did manage to put up a good fight during the quartz crisis as they were already at a lower and more competitive price point however they were by no means immune. Enicar were infact among the first watch brands to make use of the Beta 21 movement that the Swiss hoped to combat the influx of cheap japanese quartz however it was a losing battle. In 1987 Enicar filed for bankruptcy and piece by piece the Enicar name was dismantled with the remaining watch cases being sold to the owner of ChronoSwiss. The brand name was put up for auction and was bought by a Hong Kong investment company and ever since modern Enicar have never been as popular with collectors as fans feel the quality of the timepieces began to decrease. The Enicar website is still somewhat active yet I received no response from that when I enquired as to where I could find a stockist. From what I can find , the company seems to be be solely focused on the Asian market now and by no means did they fall as far down as Wittnauer whose watches now can be bought in pharmacies and discounted at Macy's. Out of all the three brands I've looked at this year who have been lost to time I think it is probably Enicar that could make a comeback. Wittnauer still exist in the United States in some manner of speaking and no-one has any interest in revitalizing them and Universal Geneve would require an insane amount of investment to start producing complicated movements of the same calibre again even though I'm sure many watch fans would welcome their return. If the Enicar name is bought from their current owner then perhaps it could be brought back to like but only time will tell if Enicar returns from being lost to time. I'd like to thank aaroncynthia for permission in using some of their photos, I highly recommend following them on instagram for some top quality watch pictures. Out of all the brands I've covered on Lost to Time, Gallet is unique. I've scoured through countless websites, archived pages and forum posts, I contacted museum directors and board members and now two months later I'm finally ready to tell Part Two of Gallet. For nearly seventy four years Enicar produced watches that have been worn by mountaineers, a race car driver, a Russian rocket scientist, U.S. Navy Divers and a ship. Yes, a ship has worn Enicar but I'll get to that later. Do you enjoy reading about Horological History and other watch industry articles? By signing up to the Timepiece Chronicle newsletter you'll get weekly updates on all articles published on the site.